The program will launch its first full-year course in the fall of 2018, and is aimed at teaching students to create their own apps for Apple's platforms using the Swift programming language. 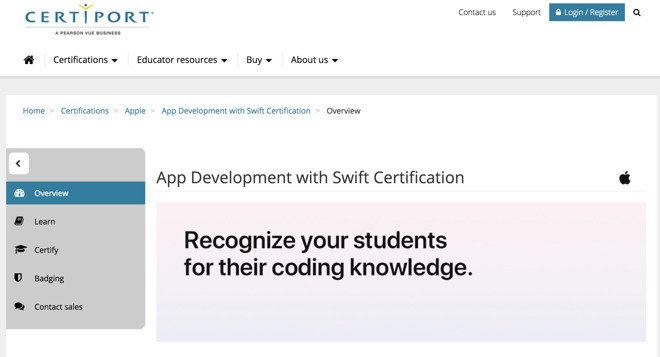 Earning the certification will then validate those students for the growing number of firms that use the Swift platform in their software programs. "Earning an App Development with Swift certification will give students the confidence they need to further their programming education or move on to a career in programming," Ray Murray, Vice President, Business Development of Certiport parent company Pearson VUE said as part of the announcement. "Earning a certification endorsed by Apple shows that they have a solid grasp on the language and can apply it - today - to create innovative iOS applications. We expect this new certification to gain widespread adoption due to the popularity of the Swift programming language." Apple first introduced Swift at the WWDC in 2014. Airbnb, Kayak, and Yelp are among the popular apps created using Swift. The language had already been taught in schools, as Everyone Can Code was created in 2016 to spread the usage of Swift in educational settings. That program was augmented this past spring with the introduction of Everyone Can Create. The new certification, though, is the first of its kind. Certiport, which is part of Pearson VUE, describes itself as "the leading provider of learning curriculum, practice tests, and performance-based IT certification exams that accelerate academic and career opportunities for learners." Certiport's Apple page has more information on the program.